While world attention focuses on ISIS in Syria and Iraq, Middle East expert warns of looming threat from Iranian-backed Shia militias. Israel should not be complacent about the threat posed by as Iranian-backed Shia militias in Iraq and Syria, an Israeli expert has warned. While much of the world's attention has been focused on the Sunni Islamic State (ISIS or ISIL) and its bloody campaign through both countries, analysts are increasingly warning of the growing threat from Shia militias, who play a crucial role in propping up both the Assad regime and the current Shia-dominated government in Baghdad. 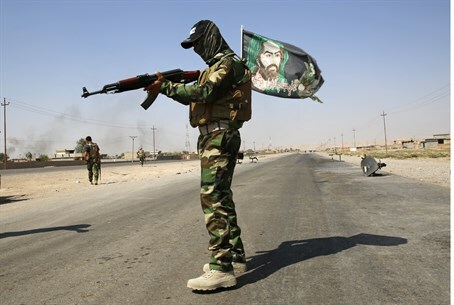 A recent report by Amnesty International said Shia militias in Iraq were responsible for countless sectarian killings - including beheadings - and are committing war crimes on-par with those of ISIS. In some cases, whole Sunni Muslim communities have been wiped out in revenge attacks by Shia Islamist fighters, many of whom seek to establish an Islamic theocracy along the lines of Iran. But while "the Sunnis are first in line" for such groups, they pose as much of a threat to Israel in the long-term as ISIS or Al Qaeda says Lt. Col. (res.) Dr. Mordechai Kedar, an expert on the Middle East and Islamic world at the Begin Sadat Center for Strategic Studies. "Every force currently fighting in Syria is interested in creating a situation where the future Syria will be in its favor... Iran hopes to use the war to tighten its control over Syria completely," added Kedar, who is also a regular columnist for Arutz Sheva. "That will be done by fortifying its position" via such militias, as it did in Lebanon with Hezbollah. At this point the war in both Iraq and Syria is essentially a struggle for dominance within the Muslim world - with Iran heading the Shia effort. But it is no secret that the long-term goal of Islamist actors on both sides of the conflict is the destruction of Israel and conquest of Jerusalem or "Al Quds." "They are not united in hatred of Israel, but it is the common denominator," he said. "Both sides see Judaism as a false religion they must ultimately wipe out." Apart from being well-financed, heavily-armed and trained by Iran - and in some cases directly commanded by the elite wing of the Iranian Revolutionary Guard, the Qods Force - recent reports have highlighted a steady flow of foreign Shia jihadists into the country, directly paralleling recruitment efforts by Sunni groups such as ISIS and Al Qaeda. Indeed Hezbollah - whose Iraqi branch alone has reportedly tripled in size - is "the parallel of Al Qaeda on the Shia side of the equation," Kedar warned, and the Syria conflict could produce a new generation of global Shia jihadis, much as Afghanistan did for the Sunnis in the 1980s. "Israel right now is not their goal yet but we shouldn't fall asleep on guard."